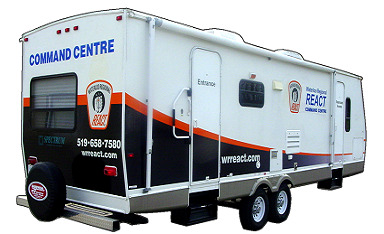 The Waterloo Regional REACT volunteer emergency service organization supports community-sponsored events and regional emergency service operations using a mobile Command Centre. 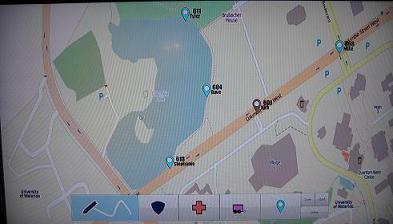 During community-sponsored events, the Command Centre is used as a hub for REACT members as they monitor the event, providing assistance and support to the organizers and the public when necessary. 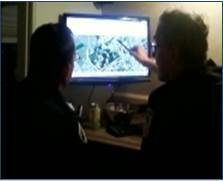 A desk in the Command Centre functions as the communications and dispatch area, allowing a REACT supervisor to communicate with community event organizers, with various emergency service agencies, and REACT members in the field as the event progresses. This communication and coordination role is a key function of REACT, as it provides a hub through which information about the event can be passed. REACT members play a critical role to ensure that all emergency service agencies and community event organizers are aware of any issues or actions being taken during an emergent incident. The Command Centre also has a multi-function area which provides a quiet and sheltered place for the emergency service agencies and REACT members to discuss events or coordinate activities both prior to and as the event progresses. The objective of this project is to investigate the suitability of large-format surface computing technologies in the REACT Command Centre, and of providing dynamically updated positioning information to Command Centre personnel to support collaboration and coordination during community events and emergency incidents involving the REACT Command Centre. A secondary purpose of this project is to examine the utility of providing dynamically updated position information to field personnel during the same operations. Cheaib, N., Cheung, V., Cerar, K., Scott, S.D. (2011). A Multi-Agency Collaboration and Coordination Hub (MACCH). Poster Presentation at Graphics Interface 2011. St. John’s, NF, May 25-27, 2011. Victor Cheung, Nader Cheaib, Stacey Scott: Interactive Surface Technology for a Mobile Command Centre. In Extended Abstracts of CHI 2011: ACM International Conference on Human Factors in Computing Systems, Vancouver, BC, May 7-12, 2011, pp. 1771-1776.